This study analyzes the US produce packaging industry. Products covered include corrugated boxes, flexible packaging, plastic containers, trays, and other products (including RPCs, wood crates, foam boxes, and molded pulp baskets). Need to know key findings about shifting trends in the produce packaging market? This study presents historical demand data (2007, 2012 and 2017) and forecasts for 2022 by product and application. 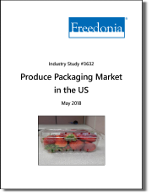 Information and data on protective packaging products were obtained from numerous primary and secondary sources, including industry participants, government agencies, trade associations, online databases, and other Freedonia Group studies. Macroeconomic and demographic indicators presented in this study were obtained from The Freedonia Group Consensus Forecasts dated April 2018. Because of the Bureau of Economic Analysis’ use of chain-weighted price indices, inflation-adjusted gross domestic product components (2009 dollars) do not necessarily add to the total. Primary information was gathered through consultations with marketing and technical personnel of participating companies and other industry specialists. Trade associations like Fiber Box Association and Paperboard Packaging Council are also used in sourcing qualitative data. Need to learn about the role that acquisitions, distribution, and marketing plays in the produce packaging industry? Several hundred firms participate in the US produce packaging industry, ranging from large, multinational paper and paperboard manufacturers, firms that offer a broad range of packaging products for food and other consumer goods, and smaller companies that focus more squarely on produce packaging. Several leading suppliers have bolstered their market positions or expanded their product ranges via recent acquisitions. Smaller suppliers often thrive despite competitive pressures due to cultivation of customer relationships and subject matter expertise. This study will highlight top companies with their total company sales, their relevant US produce packaging sales, and their principal product lines. In addition to this information, you will also receive market share information. Ready for more detailed information on produce packaging? The study offers 74 charts and 49 data rich tables, in addition to all the industry context you'll need.